Chaz's School Daze: Fair Student Funding And Our Union. I don't disagree with you, but I'd argue what's even worse is that we voted for it. I mean, I didn't, and you didn't, but we did. The DOE is recruiting overseas again. A friend got off a flight at JFK last month and told me there was large contingent of young, mostly Europeans on her flight that were met at the airport by the DOE. Then there's the recruitment drives in Wyoming, Montana, Idaho, and Colorado. Now couple that with what has to be a 2000 plus ATR pool that is'nt even considered for a position and you have an idea of just one facet of Fair Student Funding. Then there's the report of extensive bullying in NYC schools that is in large part blamed on not having a social worker on staff. Where are they? They're all in the library playing Candy Crush, and not because they want to, but because they are purposely kept out of the classroom. Did I mention the number of schools closing and trimming of staffs that are creating more ATRs? Or how about the veteran teachers that wore white after Labor Day and are sitting in rubber rooms awaiting 3020a charges because their principals couldn't afford their salaries? The UFT had better not rest on it laurels with paid Parental Leave because that meteor is still enroute. Fair student funding is a policy that was put in place to circumvent the Union bylaws and the state Constitution. Also FSF is a policy that was created to reshape the education landscape so that ultimately teaching becomes a temporary job, that only the very young need apply, that no benefits shall accrue for the worker, that the worker shall be controlled fully, that tenure rights shall be abused, denied, and interfered with, that different classes of children will be given different education quality, the elimination of good middle class jobs, the elimination of job protection for the worker. FSF is a tool of the super rich to bypass the laws that are currently in place. FSF is a ruse, an illusion created to trick the general public. FSF should never have been allowed to be kept in place for this long. It is clearly a violation of the law. It is a rich person's cheap trick. So why did the Union agreed on Field Supervisors to harass and abuse ATRs like Statk does? Why are they targeting veteran teachers in every school? My principal said blacks and Puerto Ricans can’t learn. won’t be even given the chance to learn. Other things he suggested that the rich controls everything and the controls education system. If we don’t educate our citizens and target certain populations that the status quo will stay. I will fight for justice and do what right no matter what is the cost. The cost was great so far. So get rid of the senior teachers, age discrimination and they getting away with it. Hopefully people can join me in Stop them. Systemic discrimination on behalf of the UFT.and the DOE. 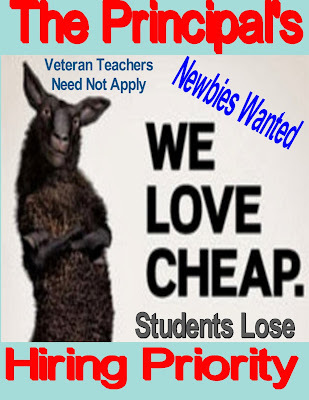 They are harassing veteran teachers with underserved unsatisfactory observations. My principal told one senior teacher "Feel free to hand in your papers, I need some fresh blood around here". @6:42 your principal has a point, but if blacks and hispanics cant learn then it doesn't really matter who is in the classroom.